It’s a real pleasure to be asked to write this blog for Restorative Justice week. I’ve been working with Catch22 for about 18 months in a variety of capacities. I teach restorative justice (RJ) facilitator training – basic and advanced skills (levels 2 and 3). I also work with the whole of the Social Justice directive delivering training in restorative practice (RP). I’m also an executive coach and often I work with teams delivering RP and 1-2-1 coaching. What is the difference between restorative justice and restorative practice? Most people ask at the beginning of the training what the difference is between RJ and RP and why I deliver the RP training 3 days over 3 months when the RJ day training is three consecutive days. Restorative Justice is part of Restorative Practice and RJ is a set of practical skills used widely within the Criminal Justice System and schools to help heal harm in a whole range of ways. Training involves learning about rigorous risk assessments etc. and practising these new skills and needs to be carried out over three days. I’ve been an RJ facilitator for 10 years, working on every possible type of case, from neighbourhood to homicide, and witnessed first-hand the remarkable healing effects that a restorative intervention can have. Having a voice and using it effectively is something I passionately believe in and I am so delighted to have brought this work to so many teams. The teams have also found it incredibly effective with their clients and some have even fundamentally changed their interview processes as a result of learning these techniques. 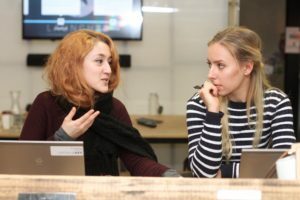 One team member told me that she analysed the interviews which had used restorative techniques compared to those that hadn’t and she said that the information and content from the restorative interviews was far deeper and richer and more productive for both her and the client. I use a whole host of techniques to bring together all the principles of restorative, using Transactional Analysis, Appreciative Inquiry, coaching skills as well as a range of restorative techniques. But, fundamentally, most of the organisations I work with have vertical management structures and my work is about creating a horizontal communication environment within a vertical structure. Catch22 is way ahead of the curve in introducing this work. It is very commonly used in schools and children’s services and, indeed, whole cities are becoming restorative; it is widely used in Sheffield and Hull for example. But organisations are behind the curve and Catch22 is showing real initiative and foresight in introducing restorative to its workforce. Restorative approaches are here to stay; HR teams are now recognising that the old ways of doing things are not really appropriate in the current climate and I receive roughly a call a week enquiring about this new restorative thing! I’m loving working with Catch22 and would like to thank Peter Jones and Lisa Smitherman for supporting me and all the teams for turning up with open ears and real enthusiasm, thank you! Find out more about the Restorative Engagement Forum here. All of Catch22’s victim services offer restorative justice, find out about them here.